January | 2009 | EASY AS PIE! I have the day off work today and as always, my husband goes to work at 2:30. So I thought I would make us a nice lunch since we never get to have dinner together during the week. I meant to make this last night, but I wasn’t feeling well after work so I just cooked the chicken breasts for this recipe and threw together a tuna melt for myself and then relaxed on the couch. -Roll out 1/2 of pie dough and line bottom of a pie plate. -Return all dough to fridge. -In a large, deep skillet heat oil over medium high heat. -Add onion and cook, stirring occasionally until translucent and starting to brown, about 5 minutes. -Add garlic, carrot and celery and cook until soft, about 3 minutes. -Add thyme, old bay, salt and pepper and cook until fragrant, about 30 seconds. -Reduce heat to medium low and add butter, stirring until melted. -Add flour and stir to combine. -Cook, stirring frequently, until roux starts to darken, about 3-5 minutes. -Deglaze pan with chicken broth, slowly, stirring and scraping browned bits off the bottom of the pan. -Remove from heat and stir in chicken. -Remove pie plate and remaining dough from fridge and pour filling into dough-lined pie plate. -Roll out remaining pie dough as desired and top the pie, making sure to have at least one large hole for steam to escape. -Brush the top with beaten egg. -Line the edges of the pie plate with heavy duty foil to protect them from burning. -Place in oven and bake until dough is golden brown and filling is heated through, about 35-40 minutes. -Remove, let cool for at least 10-15 minutes before serving. Sorry, I cut into it before taking the picture! I have a confessions to make – I am obsessed with cookie cutters. I have cookie cutters for almost every holiday and occasion, I just wish I had time to bake that many cookies every year! I have used this recipe a couple of times and it never fails. But, for whatever reason, this time I must not have been paying close enough attention because I rolled the dough a little too thin. They ended up being about 1/8″ thick instead of 1/4″ but they still taste delicious! I would describe the texture as very tender! In bowl of stand mixer, cream butter. Add powdered sugar. Blend in egg, extracts, and salt. Slowly add flour. Chill dough until firm. Roll to 1/4″ thickness on floured surface. Cut with cookie cutters. Place on parchment lined or greased cookie sheets. Bake at 375 degrees for 8-10 minutes. Cookies should not be brown. Cool, then frost and decorate. Recipe says it yields 40 cookies, I got only 30 various sized cookies. **Be sure to only bake the same size cookies on a sheet at a time. Otherwise, smaller cookies will burn and larger cookies will not be done. I made a simple icing of approximately 1 cup powdered sugar, 1 scant tablespoon meringue powder and 1 or 2 tablespoons of water, plus a couple drops of red food coloring. Just stir together in a bowl until you reach your desired consistency. I spread it on the cookies with the back of a spoon. Icing will dry hard. This is yet another recipe from my Mom! She’s been making it for years and now I make it all the time. We almost always have a batch in the fridge. Its perfect for parties, pot lucks, an afternoon snack, or to serve to unexpected house guests. It only takes a few minutes to whip up. Serve with crackers, bagel crisps, or raw veggie dippers. 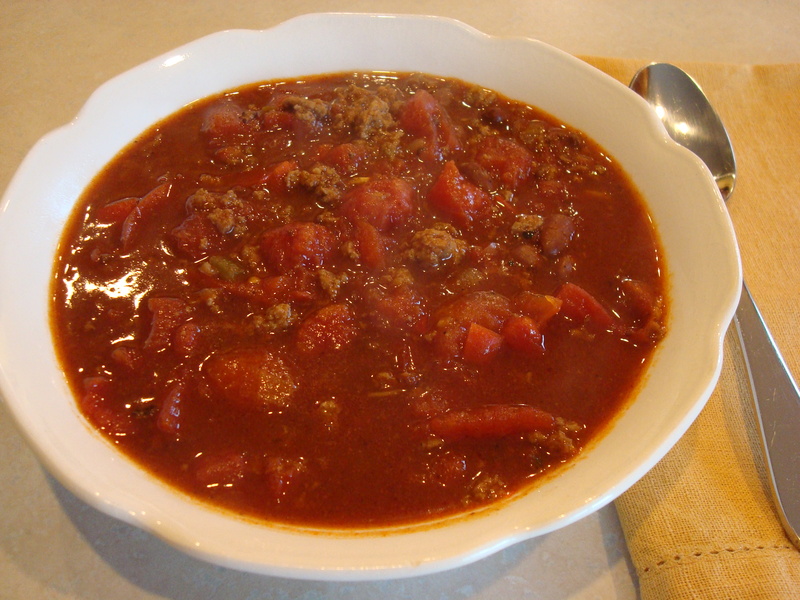 Chili is absolutely one of my favorite winter foods. It is just so warm and comforting. Now, I am NOT a picky eater, at all…except when it comes to chili. I have to have it this exact way. Because of this, I’ll never order chili in a restaurant. It is always too thick, full of beans, and just not good enough. The only place thick chili has a home is on top of a hot dog. I had to change this recipe a little bit because we like things quite a bit spicier than my parents. But you can slowly add the seasonings, tasting as you go, until it reaches your desired heat level. THIS IS ALSO AMAZING ON SPAGHETTI. AMAZING. PERIOD. (Sorry for shouting.) I think they call that Cincinnati style? I think its called Chili Mac at Steak ‘n Shake? Maybe? I don’t know, I haven’t been to Steak ‘n Shake in years, but its good! I didn’t serve it over spaghetti this time because we had spaghetti the night before. Brown the crumbled ground meat in a large skillet for 10 minutes or until no longer pink with garlic, bell pepper, and onion. Drain. Return to skillet over medium heat, add tomato paste, chili, diced tomatoes and chilies. Stir everything together. Next, slowly add seasonings until you reach the level of spiciness that you like. But, keep in mind that adding the tomato juice will make the spice less concentrated. So, either make it slightly more spicy than you normally would like. Or, to be safe, keep it mild and then taste and adjust seasoning one final time after the tomato juice is added. In a large skillet, brown meat with onion, bell pepper, and garlic until no longer pink, like before. Drain. Place in large slow cooker. Add all other ingredients and mix together. Cook on low for 1-4 hours, ideally. Leaving it for 8 hours is fine, but the sides tend to burn/blacken. The taste doesn’t seem to be affected though. OMG! This is the best chocolate cake I have ever had! Seriously it is wonderfully dense and moist and perfect just like the name implies! You must try it the next time you need a birthday cake, party cake, dessert for any occasion, or just a chocolate fix! Preheat oven to 350 degrees. Grease and flour two 9″ round baking pans. Set aside. I use cocoa powder instead of flour. Whisk together sugar, flour, cocoa, baking powder, baking soda, and salt in large bowl (or bowl of stand mixer). To that, add eggs, milk, oil, and vanilla. Beat with mixer on medium speed for 2 minutes. Scraping down sides of bowl as needed. Stir in boiling water*. Pour into prepared pans. *Batter will be very thin. Bake 30-35 minutes or until toothpick comes out clean. Cool in pans for 10 minutes, then remove to wire racks to cool completely. Frost once cool. Store in refrigerator. Yields about 10 servings. See Hershey’s website for baking pan variations. Cream butter, shortening, vanilla, and salt together with stand mixer on low, occasionally scraping down paddle and sides of bowl. This may take several minutes. Meanwhile, sift powdered sugar, cocoa, and meringue powder together and set aside. Once butter mixture is combined, slowly add sugar mixture in batches on low speed. Scrap sides and paddle between additions. It is important to keep the mixer on low speed to avoid adding air to buttercream. Once all of the sugar mixture is incorporated, add milk one tablespoon at a time until desired thin/spreading consistancy is reached. You may need more or less milk to achive this. If your cakes dome while baking, slice that off to create a flat cake. Place bottom cake on cake plate, spread thin layer of frosting on top. Place other cake on top of that and spread top and sides with remaining frosting. Are you planning a Superbowl party? Well, aren’t you glad you stopped by! These little babies will be perfect for your party! They definitely aren’t healthy or pretty, but we’re going to pretend that doesn’t matter. Its a party after all! What’s important is that they are delicious, party friendly, time friendly, and guy friendly! But, back to Superbowl parties for a minute. You can do these full size if you want them to be more of a main dish or in mini muffin tins for smaller bites. You’ll need to cut the biscuits in half or maybe even thirds to fit into the smaller muffin tin holes. The baking time will also be reduced, so watch them closely in the oven. I would start checking on them after 5 minutes. I’m not sure of the source of this recipe to be honest. If you know, I will gladly give credit where its due. Preheat oven to 375 degrees. Press raw biscuits into muffin tin holes to form cups, set aside. Brown ground beef in skillet until cooked through (add chopped onion if you choose). Drain. Return to skillet with heat turned off. Stir in BBQ sauce and seasonings. Put hamburger mixture into “cups” and top each with shredded cheese. Bake 10-12 minutes or until golden brown. Enjoy! I made this for dinner Sunday night and it was easy, quick and delicious! The leftovers taste great too. I adapted it from Brooke at http://brooke-cookiejar.blogspot.com/2007/10/fiesta.html. I wasn’t able to get a good picture of it, so go to her blog if you need to see a photo. 1 Jiffy cornbread/muffin mix (8.5 oz.) and the ingredients to prepare it. Preheat oven to 350 degrees. Spray a large casserole dish (I used a glass 7×11 Pyrex dish) with non-stick cooking spray. In a large skillet, brown ground beef with onion and garlic. Drain. Return to skillet and heat to medium low, add taco seasoning, beans, tomatoes, and corn. Stir to combine and heat thoroughly. Meanwhile, prepare cornbread mix as directed on box with egg and milk. Stir in cheese and canned chili peppers. I used a 7 oz. can of chilies. Pour meat mixture into casserole dish and press it down slightly with a spatula. Top with cornbread batter. Bake uncovered for 20-30 minutes or until cornbread is golden brown. Yields 6 really large servings. This definitely has some kick to it. If you want to reduce the spiciness, omit the chilies in the cornbread, use regular diced tomatoes, and regular corn. If you use a larger casserole dish (9×13 or bigger), you may want to double the cornbread batter.